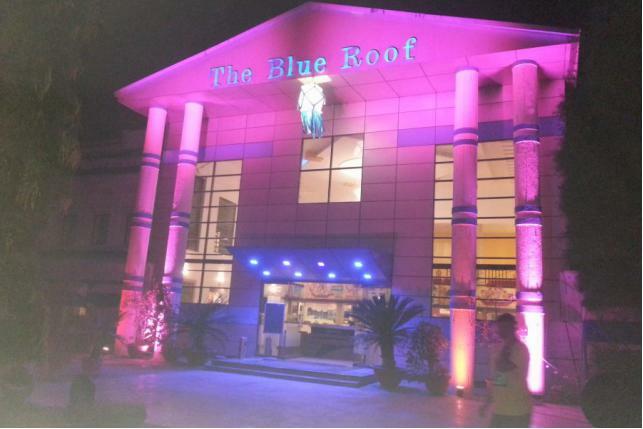 The Blue Roof Club Thane has recently celebrated its 10th anniversary. Spread across 7.5 acres of lush green landscape, it is nestled in foothills of the Yeoor Forest Range on the rapidly urbanizing Ghodbunder Road in Thane. It is your escape for a range of social, recreational and sporting facilities. The Blue Roof Club’s 2500+ Happy Member Family and their guests not only enjoy the great facilities but also get chance to be a part of its Events; some free and others at highly discounted prices, organized throughout the year to keep them rejuvenated. Members are also entitled to enjoy exclusive Membership Benefits at Affiliated Clubs in India. A perfect blend of upscale charm and contemporary facilities, the Blue Roof Club provides an incredible range of facilities under one roof – becoming an ideal place to relax, unwind and rejuvenate. Leave the chaos of city life behind as you enter a world of lush greenery, and enjoy an extensive array of Sporting and Recreational Facilities, an enticing range of gourmet delights at thier eateries, or sit back and relax at the Pool or the Sports Bar & Lounge. Host the significant events of your life in pomp and unmatched style with our great Facilities. Whether you choose them for your baby shower, engagement bash, wedding reception, or even your conferencing needs, rest assured of a royal experience; one worthy of accommodating as many as 2,000 persons in resplendence. The Blue Roof Club has the entire range of Sports Facilities to cater to all – from Swimming to Badminton, Rifle Shooting to Squash, Lawn Tennis to Carrom and all things in between. It has Thane’s most modern Health and Fitness facility. It has Thane’s most modern Health and Fitness facility. Powered by state-of-the-art equipment, its Fitness Centre is professionally managed by trained instructors to ensure you achieve your desired level of fitness. The Bluest Pool in Thane with round the clock continuous filtration. A 24 mts square pool with a small offset, the pool is continuously under the eyes of the Life Guards ensuring the safety of your loved ones even if you are not present there. The Blue Roof Club offers great food and drink in a beautiful ambiance. The restaurant is spacious with a seating capacity of 100 pax. The menu includes both Continental & Chinese besides Traditional Food. With a wide choice of cocktails & mock-tails, their restaurant is an ideal choice for a relaxed sit-out with family and friends. They also have Live Sports & other Broadcasts on the large screen in the Coffee Shop. The Blue Roof Club offers great In-door & Out-door Venue Options for events like Engagement, Mehndi, Sangeet, Weddings and other functions like Get-togethers, Re-Unions, Workshops, Exhibitions, Lohri, Kojagiri, etc. Wine & Dine is possible in all Venues. They can undertake events from 20 to 2000 pax and offer all associated paraphernalia like Sound, Lights, Setting, Decoration, etc. It also has a great event team to manage your events. The Blue Lawn to cater to up to 2000 pax. The Green Lawn to cater to up to 1000 pax. Open Air Patio to cater to up to 200 pax. The Blue Bells Banquet Hall to cater to up to 500 pax. AC Banquet Hall Cater to Up to 120 pax. AC Conference Room to seat 50 people or Theatre-Style Seat 150 pax. Other Party Venues of varied sizes to cater up to 50 pax. 5 Classy Duplex Suites and a Star Room for Stay-Overs. The Blue Roof Club organises many big & small events for members; some free and others available at the heavily discounted rate. These events can be social gatherings like Candlelight dinner, New Year Party, Christmas Party, 26th Jan, 15th August and many more; Health events like Pranik Healing Sessions, Yoga Sessions, etc. We also organize sports events and commercial events like exhibitions, etc. No more boring weekends – there’s always a new experience waiting at Blue Roof Club. World-class venues for personal or corporate events – host events your guests will never forget! Tease your senses with tantalising tastes – let the gourmand in you splurge. Escape from city life – embrace open, natural spaces. Indulge in leisure and relaxation – let all the stress melt away with an appointment at our Spa. Catch up on your needs of health and wellness – exercise will never be boring again. Pick up a new talent – so many new things you can try your hands at!